Apple has at long last made an iOS app for Find My iPhone, enabling the discovery of the location of MobileMe-registered iDevices of all types from within an app. At the same time, Apple has modified me.com in several ways, including improvements to the Find My iPhone Web app, which now matches the new iOS app in form and function. Both the iOS app and Web app make it far easier to choose a device and locate it quickly. How Find My iPhone Works — Find My iPhone uses the location services built into mobile Apple devices in conjunction with the Push and automatic Fetch options for information retrieval from MobileMe. 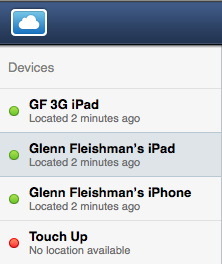 How a device reports its location to MobileMe depends on its built-in radios and receivers. An original iPhone determines its location by scanning for Wi-Fi and cell towers, and it reports its location over either Wi-Fi or cell data connections. An iPad with Wi-Fi only or an iPod touch can scan for Wi-Fi networks, and it needs an active Wi-Fi network connection to upload information. Find My iPhone requires an individual or family pack MobileMe account; an email-only account won’t work. To enable Find My iPhone/iPad/iPod touch on a given device, tap Settings > Mail, Contacts, Calendars, and tap your MobileMe account under Accounts. Set the Find My iPhone switch to On, if it isn’t already, and tap Done. In the Settings > Mail, Contacts, Calendars > Fetch New Data view, either or both Push and Fetch need to be active. If Push is set to Off and Fetch is set to Manually instead of a recurring interval, Find My iPhone cannot work, because the location is never updated. Apple recommends Push for MobileMe. 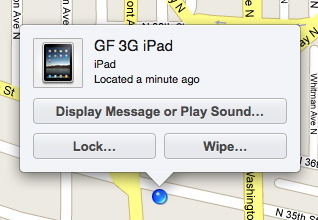 The Find My iPhone app makes this a simpler task. Launch the app, and you’re prompted for a MobileMe account and password. You can’t store the password, and the app logs out automatically after 15 minutes for security’s sake. 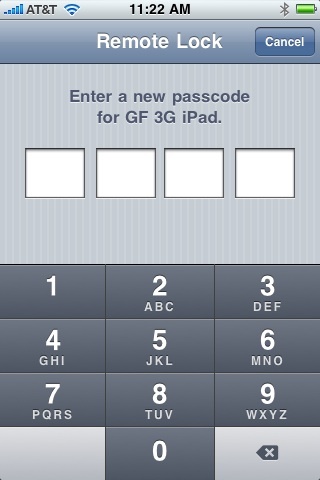 (Imagine someone stealing your iPhone or iPad and using a stored password in this app to find your other iDevices!) 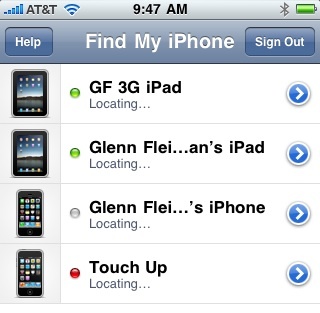 You can’t view multiple accounts’ iDevices at once, as might be useful in a family situation or where multiple devices were stolen (see how Adam and Tonya use the service in “Find My (Wife’s) iPhone,” 23 September 2009). The main screen of the app on an iPhone or iPod touch shows a list of devices with Find My iDevice enabled and registered to the account you used. On the iPad, the main view shows the location of the first item in the alphabetical list of devices by default. To see a full list of registered devices, tap the Devices button at upper left. The Devices popover lists each device and whether it is currently being located or how long ago the location was established. A Refresh button on the toolbar lets you try to grab a newer location. To see a device’s last known location in the main view, you tap its name in the popover. The last known location is displayed on a map using Google data, in which you can switch among map, satellite, and hybrid views. To interact with the device remotely, on an iPhone or iPod touch, tap the detail button beside a device’s name; on an iPad tap the info button (an “i” in a circle). The resulting screen on all devices lets you choose among the three behaviors you can inflict on the remote device: Display Message or Play Sound, Remote Lock, and Remote Wipe. 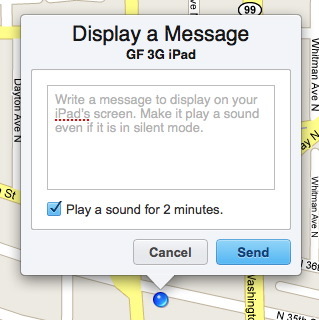 Just as with the Web app for Find My iPhone, you can send a message to the device and/or (not just “or” as the label suggests) play a sound that can’t be muted and that will play regardless of audio settings or the mute switch’s position. You can also remotely lock a lost or stolen device with a four-digit PIN, which immediately locks the device; or wipe the device’s storage. On an iPhone 3GS, upcoming iPhone 4, or any iPad, the wipe happens in seconds, due to hardware encryption; on any other device, the wipe can take minutes to hours, depending on how much you’ve stored on it. Improved Web App — The previous Web app version of Find My iPhone was starting to look a bit like the dog’s lunch if you had registered multiple devices with a single MobileMe account: a long scrolling window with maps interspersed with buttons and explanatory text. 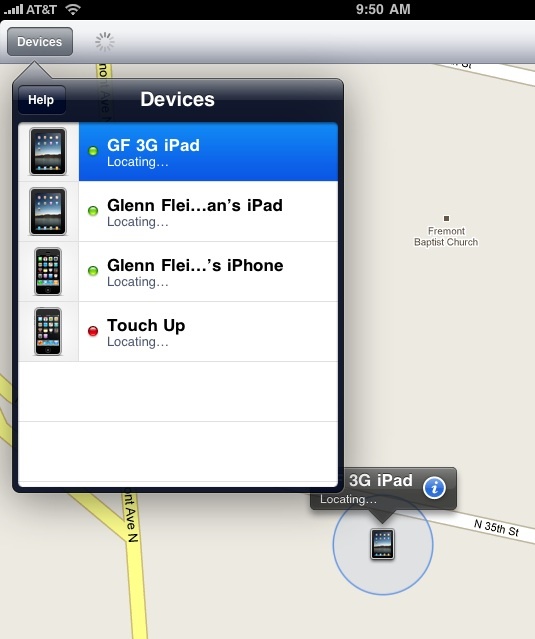 The revised version looks and works nearly the same as the Find My iPhone app. A Devices list at left shows registered mobile gear. The first item in the list is shown on a map. You can click any device in the list to have it show its current or last known location, if any. Click the detail button for the device, and the three behavior options appear. Click any of the buttons, and further options appear, such as sending a message to the device and playing a sound. As with the Find My iPhone app and other iOS software like Maps, a device with an active GPS that’s locked onto satellite coordinates is shown as a single blue dot. A device without a GPS or that hasn’t locked on is shown as a blue dot centered within a shaded blue circle that represents the margin of error. Better and Faster Than Before — Being able to walk around with the Find My iPhone app may make it easier to find a lost device or work with the police to recover a stolen one. Plus, the Web app’s update improves how quickly and easily you can find a device’s location from any computer. Nice, but it's not the app I need most. I worry less about my iPod touch being stolen than about losing the little thing in my cluttered apartment. With background apps possible in iOS4, it'd be neat to have one that makes gadget location easy. After say 24 hours in which the device isn't used, the app would release say 10 seconds of beeps every hour on the hour. That should be enough time to find it. This feature allows you to force the device to beep repeatedly until the phone is unlocked. This *is* the app you are looking for. I award you five TidBITS points (not redeemable for any value) for that second sentence. That's when you use a computer and the Find My iPhone feature of MobileMe on the Web to make your iPod touch chime until you find it. It looks like you can do this with the "Display Message or Play Sound" option. "A 3G iPad that doesn't have an active cellular data plan can still look up its location using its GPS, but it requires an active Wi-Fi link to report its whereabouts." Does a 3G iPad without an active cellular data plan use cell towers for Assisted-GPS? Is there any point in leaving the Cellular Data switch on if there is no cellular plan active? Assisted GPS requires a data connection for AT&T's network (that's not true for every cell network), as I understand it. So you won't get speedier GPS lookups. However, I do believe that cell tower triangulation is still useful, because cell towers are still being tracked as long as the cell radio is on. Here in Vienna, Austria, with a connected local Orange iPhone 3GS and an ATT-expired (momentarily WiFi only) iPad 3G, Find My iPhone puts the iPhone a block away, while the iPad is exactly where it should be... My guess is that the iPad GPS is more precise. Regardless of the app, the good news here is that you can now find more than one device. Previously MobileMe just did one device. That's incorrect. The same four devices that appear in the app also appear in my MobileMe account. This has been true for as long as Find My iPhone has been around. The device has to be registered to the account, and I just scrolled down to see more mobiles. Huh. Must've been a coincidence, I was not able to add the iPad to the service until this week. Glenn, this is a blatant attempt to get TidBITS points. Assuming API is private, for those at the margin is Mobile Me worth cost/year solely to recover/track/find all of one's (or one family's) iP___ devices? Full disclosure: also asked @gruber via public reply tweet just now. Huh, we're going to have to assign dollar values to those points (for purchase, not redemption). I think MobileMe is worthwhile at about $80 (individual) or $130 (five accounts), bought via Amazon for discount. At about $7-$8 per month for sync, Web app access, email (if needed), theft recovery, and a few other things. Quick reply! Thanks. Is it still worth $7 - $8 a month if just for theft recovery/locating feature? What I am trying to get at is, hypothetically, what if one has no use for sync, Web app access, email, and the few other things? Still worth it IYHO? I guess you have to look at it like this is insurance or not. For $80 per year, it's not a good price to pay for a $100-$700 replacement cost (AT&T will charge you something in that range depending on your contract eligibility). It's useful if a phone is lost or stolen, but doesn't guarantee anything. What would be great is if there were an iPhone/iPad insurance policy that was heavily discounted if you used Find My iPhone and could show it was enabled at the time of loss. As insurance, it's unlikely to be a good value, since it doesn't guarantee that you'd get the device returned. I use it about once per month to find my iPhone, typically when I've set it down someplace weird and I am running late, trying to leave the house. 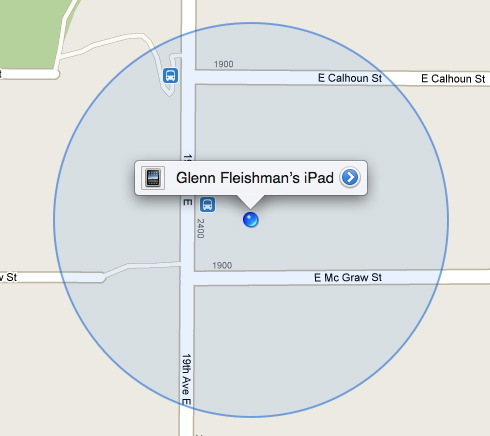 So, far, the iPad is big enough that I don't forget where it is. I just played with the new FMIP app, and am disappointed that it still doesn't allow you to drop a pin on the web map and have it mail or SMS the latitude/longitude coordinates or nearest street address. You can locate on a map, but there's nothing to make a permanent reference of the map point you can load on any other map (e.g. google maps, google earth). Are you supposed to take a screen shot with FMIP? Sounds like a good feature addition for the next version. A screenshot is pretty easy - just press the Home button and the Sleep/Wake button simultaneously.